It takes a lot to be a modern woman of today. A greater energy requirement is needed for the fulfillment of personal as well as professional commitments. The protective armor is created from the foods a woman takes. Calcium: Calcium is an important component of a healthy diet and a mineral necessary for women. Women are at a greater risk of calcium deficiency during pregnancy, lactation and the menopausal period. The RDA (Recommended Daily Allowance) for Indian women is up to 500 mg/day and the pregnancy and lactation RDA is 1,000 mg/day. Iron: The basic function of iron is the formation of hemoglobin in the red blood cells. 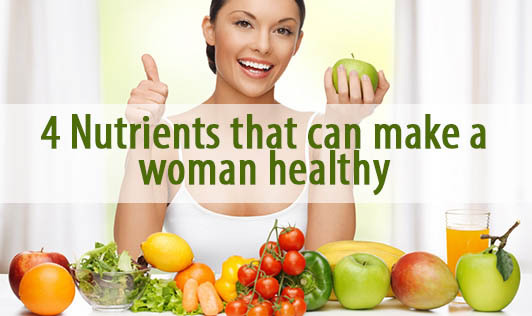 Women are at a greater risk of iron deficiency owing to blood loss during menstruation. Pregnant women have the highest requirements of iron as they need an increased blood supply in pregnancy to suit the needs of the growing baby. Vitamin B12: Vitamin B12 is present only in animal food and hence there is a risk of deficiency in women who are vegetarians. Vitamin B12 is responsible for the metabolism of folic acid. In older women, vitamin B12 is used for psychological symptoms including senile psychosis (marked by delusions and hallucinations). It has also been used for treating other symptoms including fatigue, nervousness, irritability, insomnia, memory problems, depression and poor balance. The food sources are liver, kidney, meats, fish and dairy products. The RDA for Indian women is up to 1 µg/day. Folic Acid: All women need folic acid. When a woman takes enough folic acid before and during pregnancy, it can help prevent major birth defects of her baby's brain and spine. Folate deficiency leads to elevated homocysteine levels, which, in turn, leads to an increased risk of bone fractures, osteoporosis and reduction in bone mineral density. The RDA for Indian women is up to 100µg/day and during pregnancy the RDA goes upto 400µg/day. The food sources are broccoli, asparagus, bananas, orange, peas, nuts, breads, cereal, wholegrain flours and folate fortified products. Women, wake up! Transform a conception into an implementation.